To shop at AmazonSmile simply go to smile.amazon.com from the web browser on your computer or mobile device. Tens of millions of products on AmazonSmile are eligible for donations. You will see eligible products marked “Eligible for AmazonSmile donation” on their product detail pages. You use the same account on Amazon.com and AmazonSmile. On your first visit to AmazonSmile, please select Child Center – Marygrove as the charitable organization to receive donations from eligible purchases before you begin shopping. Your selection will remain in the system, and then every eligible purchase you make on AmazonSmile will result in a donation to Marygrove. To learn more about the Amazon Smile program click here. For questions related to Marygrove and Amazon Smile, contact Courtney Noto at cnoto@mgstl.org or 314-830-6209. Schnucks will donate a percentage of your total monthly purchases to Marygrove. 1. Pick up a card at any Schnucks store or contact Sr. Rita Downey at 314.830.6201 or rdowney@mgstl.org. 2. Register your card online or call (800) 931-6258. If you already have a card please consider adding Marygrove. 3. Shop at Schnucks and have your card scanned when you check out. 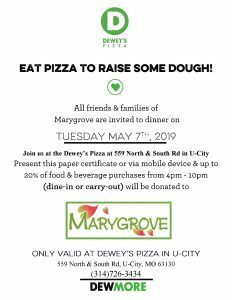 Proceeds from Marygrove’s fundraising events support its mission of providing residential care and treatment for abused and neglected children, adolescents and young adults and crisis and respite care for children and their families.